Selecting a college these days is a lot like buying a house. Money should be as important as the amenities and location in choosing a college, just as it is when buying a house. And like buying a house has the basic function of providing shelter, so the purpose of college is to provide you an education. Connections are great and all, and I will get to those later, as promised, but don’t get blinded by the future promise of the connections you think you will make, or by the present promise of a really cool gym and dorm room, or all that tradition and ivy-covered walls. When I have worked with groups of students who ended up going to different colleges, they have come back to me and confirmed that the basic product–a good education–is remarkably similar, campus-by-campus. Continuing my house analogy, I just looked up foreclosures in the wealthy enclave of Alamo, CA, and opened up a house going into foreclosure that has 8,000 square feet and seven bathrooms. The ego benefit of having a Harvard sticker may not outweigh paying five hundred bucks a month for student loans for seven or ten years, or handing on debt to your children, just as the ego benefit of having 8k square feet with a view from the side of Mount Diablo is meaningless when you cannot pay for it, or are trapped by the payments. Keep in mind that financial aid packages can be adjusted upward or downward every year. Don’t get buyers remorse next year, or the year you graduate and get your first loan payment letter. The most important thing about a college education is not the name of the school. It is the degree itself. I know this sounds like what I just argued, but bear with me for the details. The social connections made at an elite college provide a boost that is notable mostly for low-income and First Gen students. Most solidly middle class (and up) students already have connections; for them, brand name and social considerations should not be at the top of the list, if money will be a problem. But studies show that the degree is the main thing–if you have 100,00 dollars in debt after going to an elite school, versus say 20k after going to a state school, you are not likely to see enough of a difference in income to make that a good payoff. 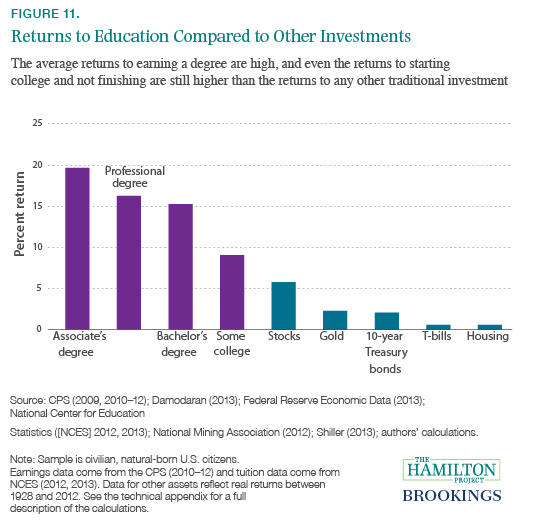 To repeat, with feeling: Getting a degree is the most important thing, not which college it is from, in terms of incomes after college, and doubly not so for any technical major (engineering, et al) or finance or business . . . The takeaway is put the degree itself and the cost at the top of your considerations. If you are from a family that will not get good financial aid, and tuition, et al, will be hard to carry–especially if private student loans are going to be needed–and you have other options, I suggest really considering those cheaper options. Also note how long the latest financial expansion is and plan on a recession starting anywhere from next month to, at the latest, your junior year in college. Still feeling good about the financials? If you want to major in something like Art History or English, but feel you cannot because of cost, you should look for a cheaper school. If you do well in any major, and plug in the right minor that gives you some skills, you can get a good job. A recent client, for example, majored in lit, with a Comp Sci minor and is not doing animation and web design, with all kinds of things opening up for him. You should ignore people like Peter Thiel, who claim college is somehow not necessary, and go, if you can. Notice that Thiel has not one, but two Stanford degrees. But I do agree with Thiel on one thing: too many people are leveraging and taking on debt to go to college. So go to a community college with a clear university target to follow, if money is an issue. And make that university a public, in-state school for the best bang for your buck. As the figure shows, however, without a college degree a child born into a family in the lowest quintile has a 45 percent chance of remaining in that quintile as an adult and only a 5 percent chance of moving into the highest quintile. On the other hand, children born into the lowest quintile who do earn a college degree have only a 16 percent chance of remaining in the lowest quintile and a 19 percent chance of breaking into the top quintile. In other words, a low-income individual without a college degree will very likely remain in the lower part of the earnings distribution, whereas a low-income individual with a college degree could just as easily land in any income quintile—including the highest. For more on that Brookings study, which shows that the poor still don’t get as good a deal as the rich (but still: get the degree): Brookings. So what role do U.S. colleges play in promoting upward mobility? According to the authors, their analysis of the data yielded four main findings. First, access to colleges varies greatly by parent income. For example, children whose parents are in the top one percent of the income distribution are seventy-seven times more likely to attend an Ivy League college than those whose parents are in the bottom income quintile. Contrary to public perception, colleges in America are just as socioeconomically segregated as the neighborhoods where children grow up. Second, within a given college, children from low- and high-income families end up earning very similar amounts. In other words, colleges are successfully “leveling the playing field” for the students they admit, and poor students don’t appear to be “overmatched” at selective colleges as some observers have suggested. On average—and regardless of socioeconomic background—the subsequent earnings of students who attend “elite” schools put them in roughly the eightieth income percentile versus the seventieth percentile for students at other four-year colleges and the sixtieth percentile for students at two-year colleges. Finally, although the fraction of low income kids attending college increased from 38 to 46 percent during the 2000s, the number attending colleges with high mobility rates fell sharply, while the fraction of low-income students at four-year colleges and selective schools was unchanged—even at Ivy League colleges, which enacted substantial tuition reductions and other outreach policies. Most of the increase in low-income enrollment occurred at two-year colleges and for-profit institutions.